The list goes on. You are desperate to make your dog stop. But he refuses. You are at your wits end. It really isn't all that hard. You just need the right approach... the little secrets that tell you what works. You need clues to guide you. And you need to know how to apply the right techniques to get results. "How To Deal With Nuisance Behaviors" gives you those secrets. And it tells you where to get the clues. It explains why dogs do what they do. It gives you an insight into how a dog thinks. It tells you what certain behaviors mean. And most importantly, it gives you answers. You will discover how to respond to all of these issues and more. Welcome to your dog's world! What you will learn in this book might surprise you. Especially when you see how simple things can make a huge difference in your dog's behavior. This is just the start. If your dog's need to socialize has not been met properly, you will have problems. They usually learn this stuff from their mothers and litter mates. But often, puppies don't get that opportunity. Usually because they are taken from their mothers too soon. Or because they have been treated poorly. If that happens, what can you do? The damage is already done. Right? It will take time to socialize your dog. It will happen. But you have to be committed. You have to know the right things to do. One misstep and you will have to start over. Punishment is not the answer to your dog's nuisance behavior. Positive dog training is. You will find out what it takes in this manual. It addresses many issues that you might be facing. And then it tells you how to proceed to get the results you want. This is one important tip that can make all the difference. The manual talks about what to study and what to do with the things you find out. Most dog owners never do this. They think of their dogs as pets who must obey them. There's far more to it than that, as you will see. Every dog wants and needs a strong leader. Are you that person? If not, a lot can go wrong. At the top of that list... he will try to take over. His nuisance behavior can be a result of his mistrust in you. Or it might be that you have not set down the rules. Or maybe you do not enforce them... all the time. Or perhaps you forgot to let him know what the rules are. Your dog needs more than food and shelter... and a strong leader. He needs stimulation. You will be amazed to see the changes in him when you give him some on a regular basis. Find out what you can do to stimulate him the right way so that he forgets all about being a nuisance. These might come because your dog doesn't trust you as his leader, or he might just be dominant. If you don't learn how to put him in his place, things could turn nasty quickly. Dogs don't need punishment. They need understanding owners who know how to address the issues. They need owners with strong communication skills that cross the human-canine barrier. 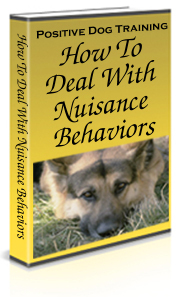 If your dog's nuisance behavior is getting the better of you, this manual will help a lot! It covers many of the common issues that dog owners face. It provides you with training techniques that actually work. Imagine being able to stop just one nuisance behavior by taking a small action. This manual offers many such solutions. It even gives you tips on how to spot behaviors that can mean your dog has other issues. Your dog could need medical attention. We cover that, too. Don't put up with your dog's nuisance behavior. "How To Deal With Nuisance Behaviors"
Simply push the button to Order Now and in a matter of minutes, you can download your copy and start solving your dog's behavior! If you are not completely satisfied, you can ask for a refund within 30 days of purchase. Your money will be courteously refunded, no questions asked.